AP Telugu Pandit & Hindi Pandit 2017-18 batch Examinations to be conducted from 23-08-2018 to 28-08-2018 as per Rc.No. 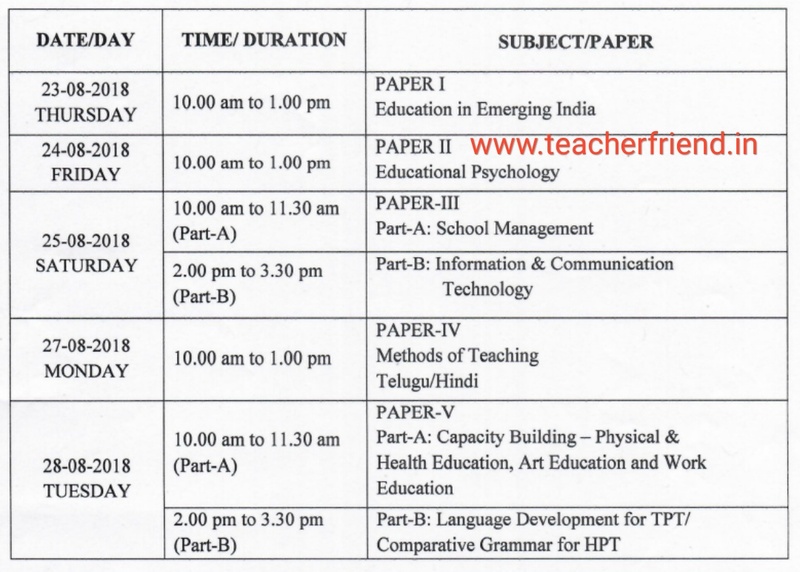 35/E1-1/LPT/2018 Dated:31-07-2018/AP Telugu Pandit (TPT) / Hindi Pandit (HPT) 2017-18 batch Examinations to be conducted from 23-08-2018 to 28-08-2018 as per Rc.No. 35/E1-1/LPT/2018 Dated:31-07-2018/AP Telugu Pandit (TPT) 2017-18 batch Examinations to be conducted from 23-08-2018 to 28-08-2018 as per Rc.No. 35/E1-1/LPT/2018 Dated:31-07-2018/AP Hindi Pandit (HPT) 2017-18 batch Examinations to be conducted from 23-08-2018 to 28-08-2018 as per Rc.No. 35/E1-1/LPT/2018 Dated:31-07-2018/AP TPT / HPT 2017-18 batch Examinations to be conducted from 23-08-2018 to 28-08-2018 as per Rc.No. 35/E1-1/LPT/2018 Dated:31-07-2018/AP TPT/HPT Traing 2017-18 batch Examination Time Table Scheduled Dates from 23-08-2018 to 28-08-2018. AP Telugu Pandit (TPT) / Hindi Pandit (HPT) 2017-18 batch Examinations to be conducted from 23-08-2018 to 28-08-2018 as per Rc.No. 35/E1-1/LPT/2018 Dated:31-07-2018. PRESS/MEDIA NOTE It is hereby notified that the TPT / HPT Examinations for Regular candidates of 2017-18 batch and once failed private candidates for earlier examinations to be conducted from 23-08-2018 to 28-08-2018 at the identified examination centers in A.P. as per Rc.No. 35/E1-1/LPT/2018 Dated:31-07-2018 . The revised Time Table Day wise/Subject wise as follows.